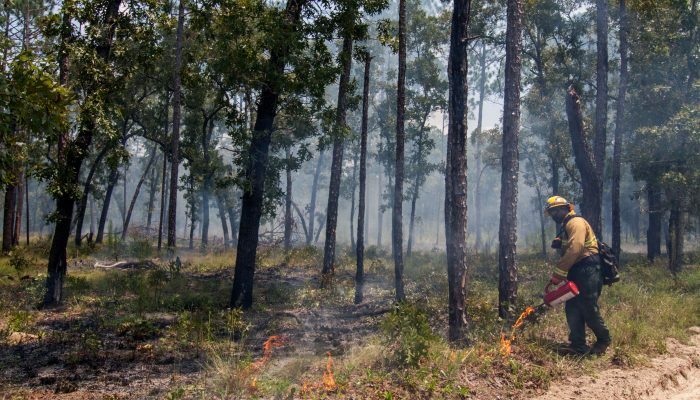 Two newly released short films, linked and described below, explore how land and wildlife managers are using prescribed fire in Florida's scrub ecosystems to support the return of threatened and endangered species and improve landscape resiliency. Surviving Fire: In the Florida Scrub features three decades of fire ecology research, exploring the unexpected ways plants adapt to survive fire and paying tribute to individuals who dedicate their lives to fire management. Filmmaker Jennifer Brown uses time-lapse photography, drone videos, and dramatic images of prescribed fire to feature the critical role of fire in the scrub landscape. In Queen of Red Hill, the importance of fire-maintained gopher tortoise habitat is explored by tracking one female gopher tortoise. #21, or the Queen of Red Hill, has been studied by Archbold Biological Station researchers since 1968. Gopher tortoises like the Queen of Red Hill have faced dramatic habitat loss over the past century and were listed as a threatened species in 2007. After decades of fire suppression, fire was reintroduced to Red Hill in 1977 to improve gopher tortoise habitat. Fire restores open areas needed by gopher tortoises for nesting, basking, and feeding. To learn more, visit www.southernwildfire.net.